One of the operation challenges to single barge floatover is to handle the heave motion of the installation vessel induced by the environment during the floatover operation. The natural period values of the vessel carrying the topsides fall in the period range of long waves such as ocean swell. In the region like West Africa, swell is often the dominant environment factor, HIDECK method is not suitable for the direct application. Two single vessel floatover methods are capable of handling the swell induced motion by specially designed equipment and operation procedures. They are the UNIDECK method and the Smartleg method. The UNIDECK method is an “active” floatover method. The UNIDECK transportation/floatover vessel is equipped with a specially designed jacking system which makes possible for the mating process to be reversible during the operation. The same vessel/barge can do both HIDECK floatover and UNIDECK floatover depending on what installation equipment put onboard. A vessel with UNIDECK equipment can carry out the floatover operation by only using the ballasting system as the HIDECK method. 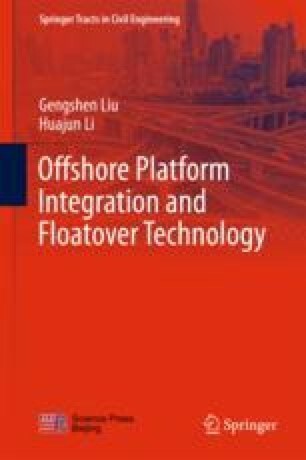 The UNIDECK method has been quite successful in offshore open water platform integration. The SMARTLEG technology is also capable of handling the swell environment. Different from UNIDECK, SMARTLEG system is designed to avoid the taking place of the impact during the mating process, hence it was also called “shockless floatation method”. However, this technology has not gone very far with only one offshore application. Discussion in this chapter covers the technical details of these two methodology through the presentation of real projects. Article: Ekpe Phase II, Nigeria. Offshore Technology http://www.offshore-technology.com/projects/ekpe/ekpe1.html.